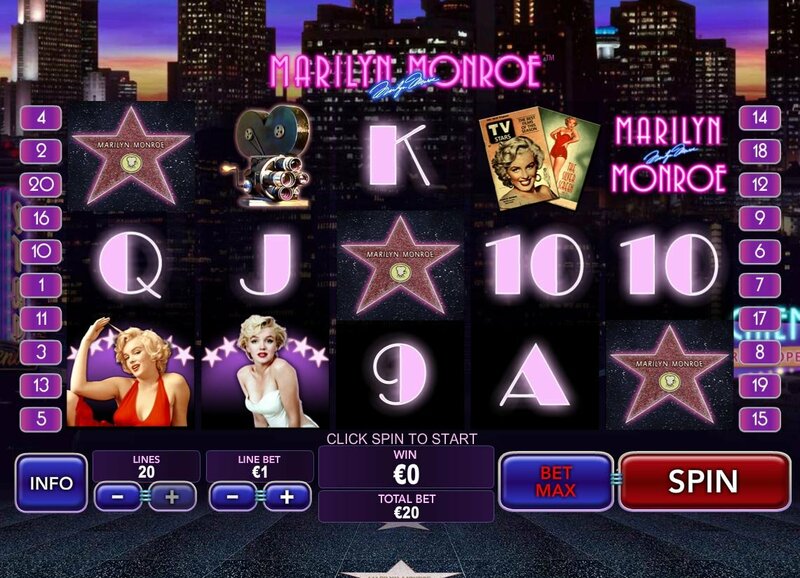 Take a walk down the Hollywood Hall of Fame with Playtech’s Marilyn Monroe online slot game. This relatively simple, but well-designed game brings a glamorous appeal to playing online that should accompany every casino experience. The ever so alluring Marilyn Monroe slot game features a 5-reel, 20-payline, non-progressive video slot. 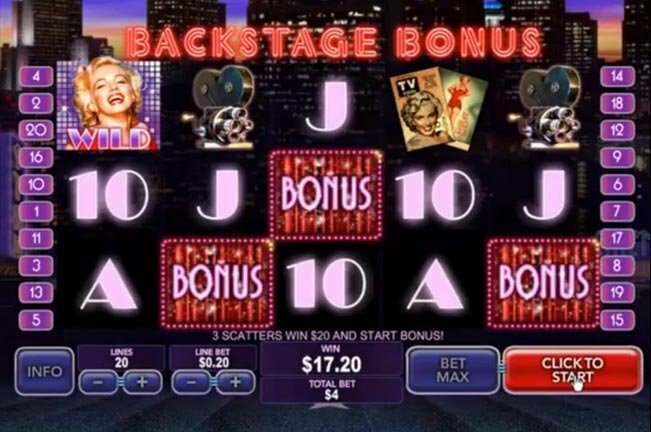 With a maximum jackpot win of $75,000, the game includes a wild symbol, scatter symbol, multiplier, and free spin all adorned with photographs of the iconic screen legend, Marilyn Monroe. Reels of her name on the Hollywood Walk of Fame star, letters and numbers lit up in phosphorescent pinks and blues, pin-up magazine covers, film cameras, and iconic images of one of the most beautiful women to appear on film flash across the screen while jazzy music plays in the background. With the right combinations, Marilyn herself comes to life portraying the legendary scene from The Seven Year Itch with her holding down a white dress over a ventilation shaft. It’s difficult to resist the charming graphics in this video slot game. Reels of her name on the Hollywood Walk of Fame star, letters and numbers lit up in phosphorescent pinks and blues, pin-up magazine covers, film cameras, and iconic images of one of the most beautiful women to appear on film flash across the screen while jazzy music plays in the background. The Marilyn Monroe video slot’s features are very easy to understand, but possibly too simple. The video slot includes 20-paylines and does not include any fun mini-games. 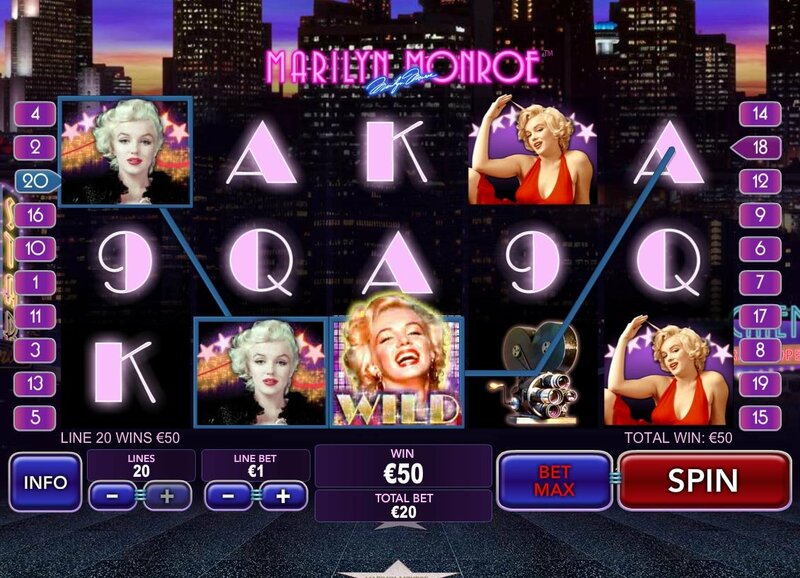 Still, the Marilyn Monroe slot offers some interesting features such as the wild symbol, a picture of Marilyn with her head thrown back. When the wild symbol lands in a winning combination, it doubles the payout and offers players the line jackpot award equal to ten-thousand coins. The scatter icons, Marilyn Monroe’s name in flashing lights, offers players scatter rewards when 2 or more of these symbols appear on the game’s reels. Players who get 3 or more of these symbols will be able to take advantage of a bonus round called “Backstage Bonus” in which players can win up to 45 free games. This round gives players 10 free spins accompanied by a multiplier of 2x. Before that, players are presented with a pin-up board that has 5 different pictures of Marilyn Monroe. Players will pick 2 of these pictures in order to earn more spins and multipliers.